One of my favorite ways to relax in the evening is to take a nice warm bath. While in the tub I usually read, watch a movie, or just sit back and unwind with a cup of tea. 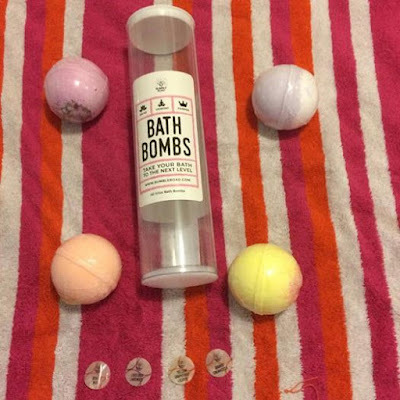 In my water I like to use bath oils, bubble baths, and Bath Bombs like these from Bumble Road. These Bath Bombs are made with epsom salts and essential oils for a nice relaxing scented bath. Bath bombs are great because you can just add them to the water and they do all the work on their own. They are also fun to watch or play with while they are fizzing in the tub. These bath bombs do color the water slightly but so far have not stained my tub that is a big thing to take into consideration. With this set you get 4 different scents to keep for yourself or give as a gift. You can even split them up and make 4 gifts out of them by designing a basket around each scent or color. The Bumble Road Bath Bombs can be found on my affiliate link below. Disclosure: MarksvilleandMe received one or more of the products mentioned above as part of a promotion with Tomoson and Bumble Road. Regardless, MarksvilleandMe only recommends products or services we use personally and believe will be good for our readers. Some of the links in the article may be “affiliate links.” This means if you click on the link and purchase the item, I will receive compensation. If you would like MarksvilleandMe to review a product or service please contact us at marksvilleandme@gmail.com.